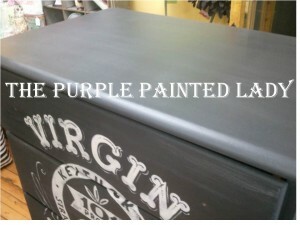 My current project that I am working on…… and I love it. I hope someone out there will too and hopefully purchase it! 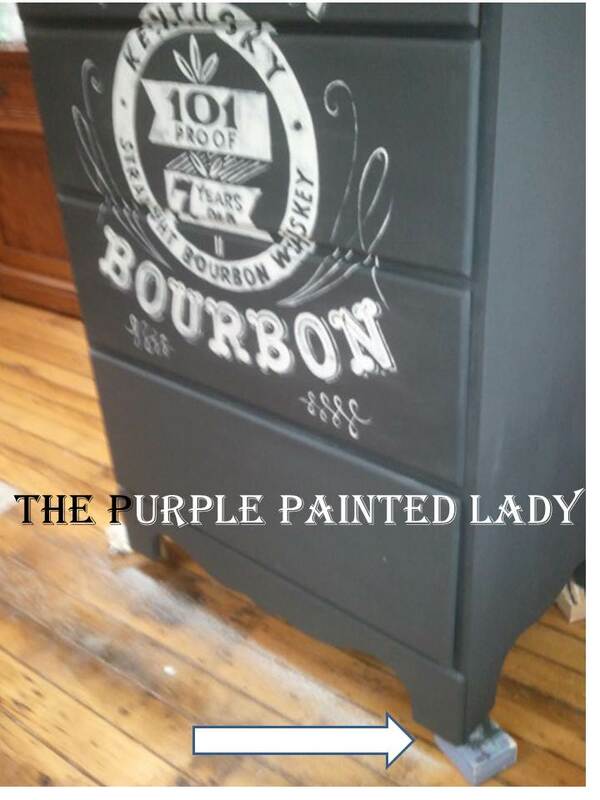 This dresser is painted in Graphite and Pure White Chalk Paint™ Decorative Paint by Annie Sloan. I am very excited about it- and I had to share it. Once I was done with the detailing – I planned on making it look a bit worn by sanding the surface strategically with some 220 and 400 grit sandpaper. Here is a helpful tip for when you paint a dresser front…once you have the lay out done, feel free to remove the drawer and set it to make the painting easier! 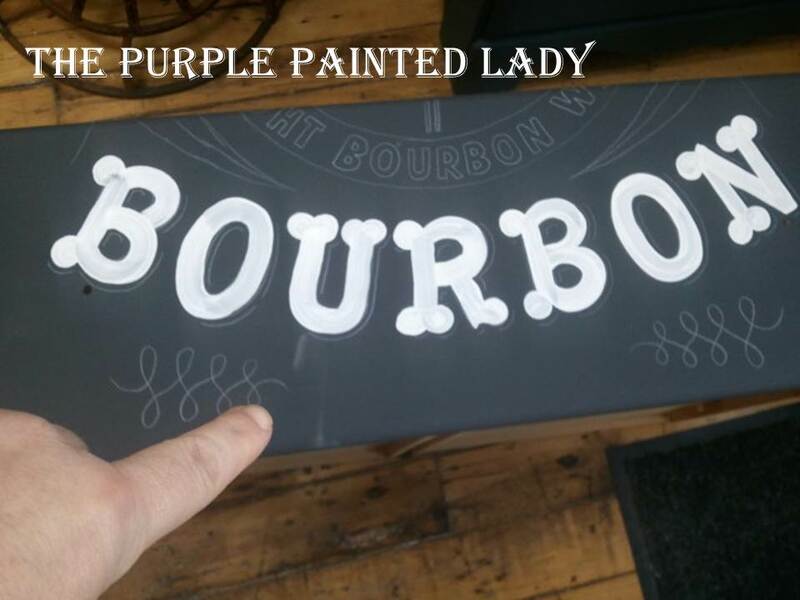 Also, don’t panic if when using Chalk Paint™ and prior to waxing you get a light scuff mark, like what I am pointing at in the photo below. When you apply Annie’s Clear Wax that all disappears. But note, I am not referring to scratches or gouges. Always have a copy of the image you are painting near by to reference. In the photo below you can see how I like to tape mine using Painter’s Tape to the piece so I can easily reference it at all times. 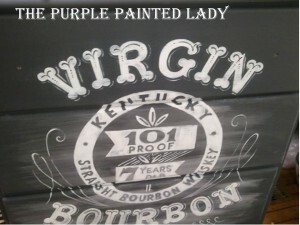 I learned this when I primarily only painted murals. I would tape 4 copies of what I was painting above, below and on both sides of the area I was painting on the wall. This does really help a lot! Now after painting the detailing on, my next step is to lightly sand the surface to even out the paint. There are pros & cons to sanding or distressing BEFORE applying your first coat of Clear Wax. I typically sand BEFORE and will explain why in this post later today below. Something I wanted to share now though, is that when you sand prior to waxing over a dark Chalk Paint™ color like Graphite (as I have in my photo below)…you will get this residual white chalky look. Don’t panic! What I do to remove this “chalky effect” is GENTLY blow and wipe with a DRY towel as much of it off. (don’t use a moist towel since that powder are tiny particles of chalk paint and the water will reactivate it into a “wash.”) Do not be concern with removing it so it is all gone! First, you will not be able to. Secondly, it is not necessary because as soon as I apply the clear wax…all of that disappears. 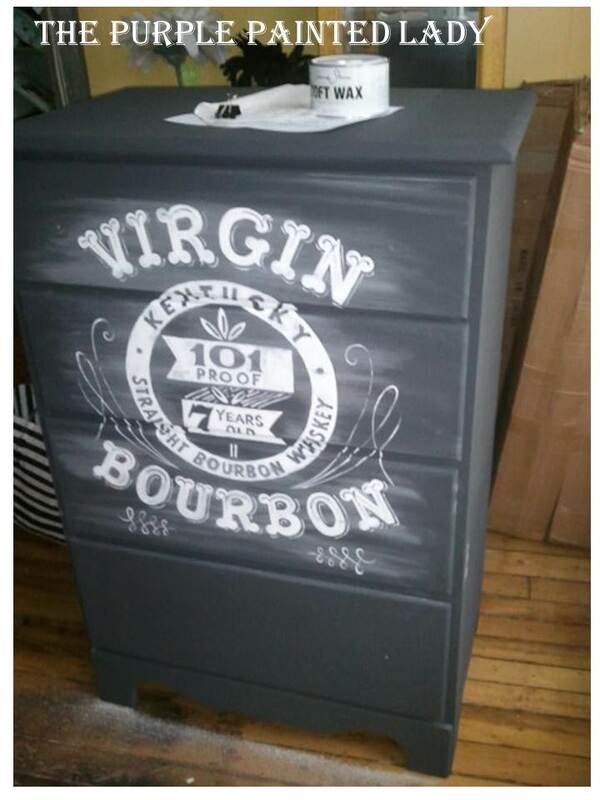 The photo below shows what the front looks like after applying clear wax to the top drawer. Notice, that white chalky residue or scratch look goes away on it! When painting or waxing – place your piece up on blocks so that it easy to get right to the bottom of the feet without dirtying your floor. Once done applying the wax (and please reference my video here if you need wax application instructions.) But after I applied the wax and removed the residual wax per my instructions, I gently buffed out the surface. The photo below is after I am done with all of this. I ended up painting the inside of the drawers with Napoleonic Blue and waxed them. The only thing left is to add some black enamel knobs. 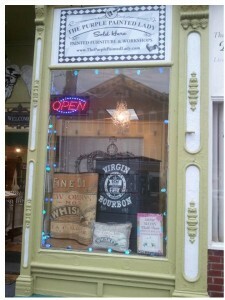 I couldn’t wait to get it into the window though, so here it is….ready for sale! I hope you like it. 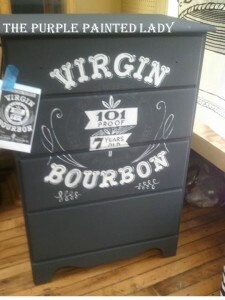 It comes with my girlfriend Jeanne’s Bourbon Slushie recipe! Perfect for the holidays. I will post a final photo when finish! 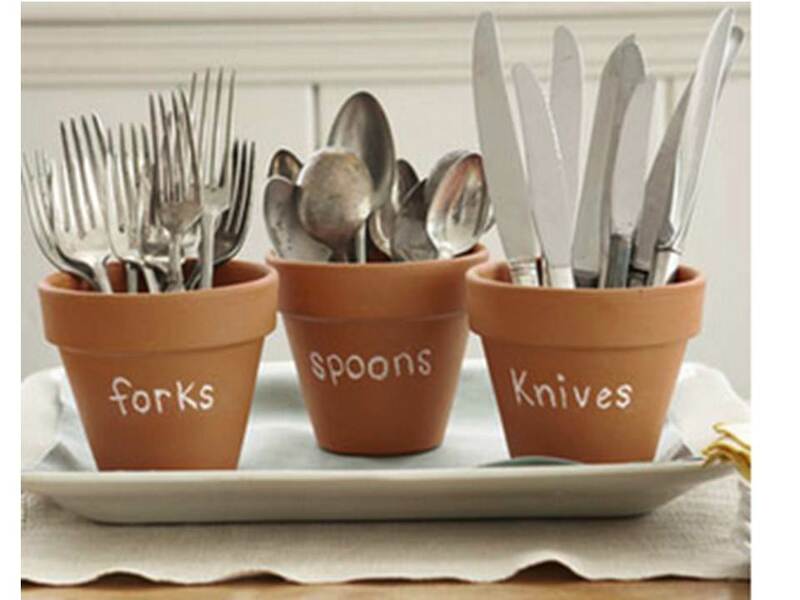 (and don’t worry…I have something in the works that I will reveal soon to show you exactly how I do this!!!!!) Something that will be available to you via my on-line store. Bow to the King- or should I say …Queen! 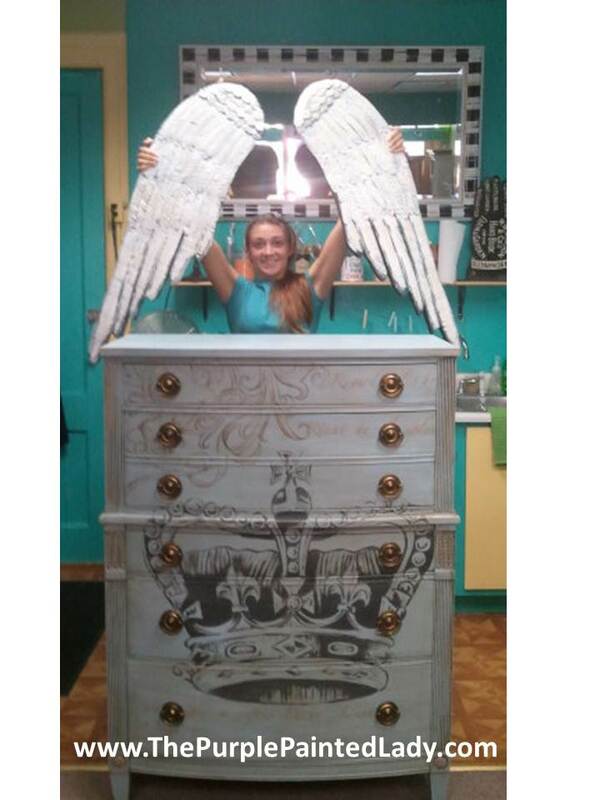 $680 Tall Boy Dresser with Wings! 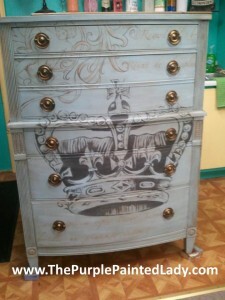 *** $680 Royal Tall Boy with Wings! If you love whimsy- you will love this tall boy. Find him at The Shops On West Ridge starting Thursday, August 9th. 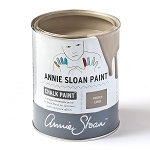 Hand painted in Louis Blue, Graphite & Coco Chalk Paint™ Decorative Paint by Annie Sloan and embellished a bit with some pale metallic gold…clear & dark wax. Embellished with an innocent Cherub who is waiting patiently for his wings while sitting on a soft set of heavenly scrolls in the upper left corner. Add some beautiful delicate French script about springtime in Paris. And of course- the symbol that represents the head of state & monarchy – a Regal Crown.. So can I dare say….Bow to the King- or should I say …Queen!? This ensemble is dedicated in honor to my kitty Biscuit! he earned his angel wings on 8/7/2012. He was a warrior and so brave…now he is a king! Always & forever Biscuit!!! Scatter Mats Arriving in June! LOVE, Love, love these! I am in LOVE with these floor coverings! 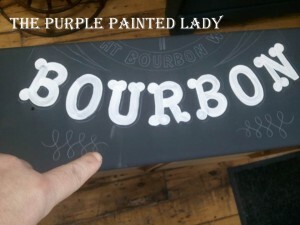 Just a little preview below of some of the coolest scatter mats ….arriving at The Purple Painted Lady this month! I test everything I buy before selling. 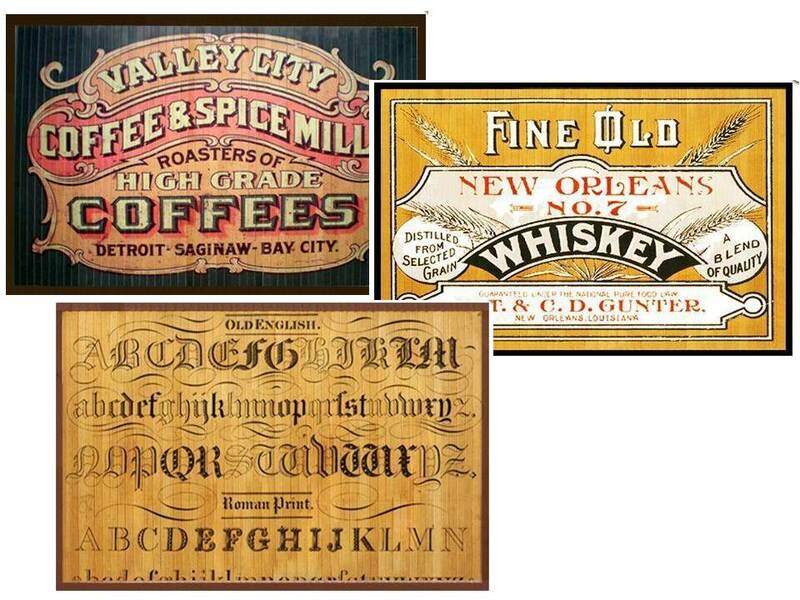 I purchased one of the 6 X 10 lettered mats a year ago. I have 2 BIG Rottweilers and they run & play on this mat- and it looks just as nice today as when I brought it home. I am very impressed! I also love that these come with their own non-slip bottom-so there is no need to buy a pad or non-slip base! Funk it up a little and get a fresh look! I will post their arrival on my Facebook page! So stay tuned. 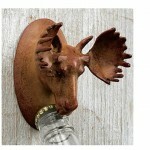 If you live in the country- you were probably Rustic Chic before it was cool! 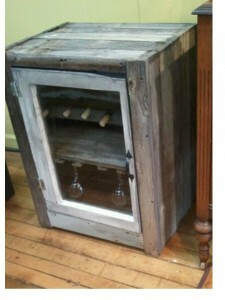 I had to write this little blog in honor of my new Rustic Chic Wine Cabinet for sale…read on and you will understand! When you live in an old house out in the country it is easy to be “Rustic Chic.” I will be driving along – and right there on the side of the road is a rusty gear part that came from some old tractor. 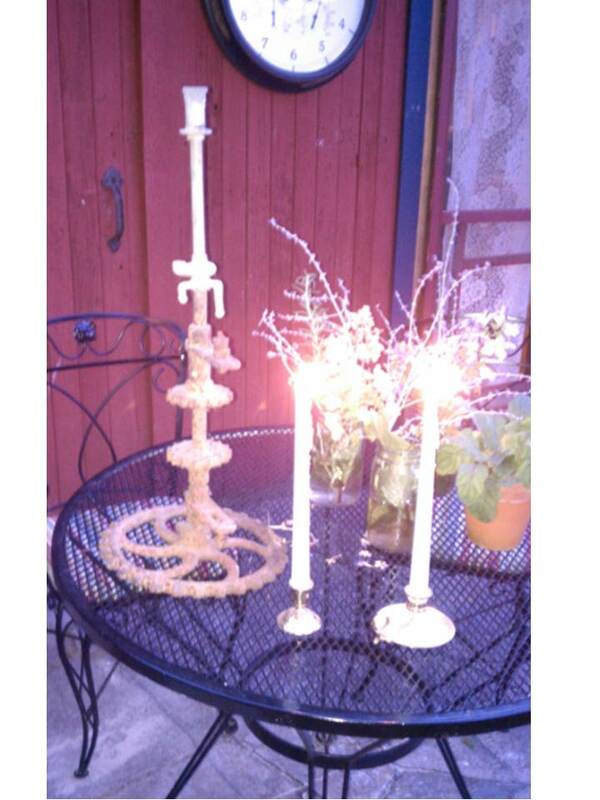 Yes- it is a rusty old gear, but to me- it is the funkiest candle holder I have ever seen that will look perfect on top of my outside dining table! It is already chippy and rusty and I didn’t have to make it look that way! SCORE! Rustic Chic is huge when it comes to design. 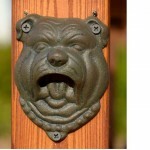 I almost wrote “interior design” but it is MUCH more than that- especially with so many of us having outdoor spaces! 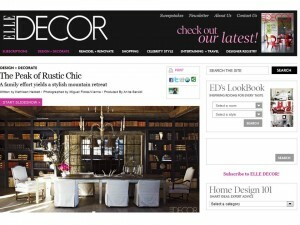 Elle Decor wrote about this a long time ago! Check out the article and their original table scape. 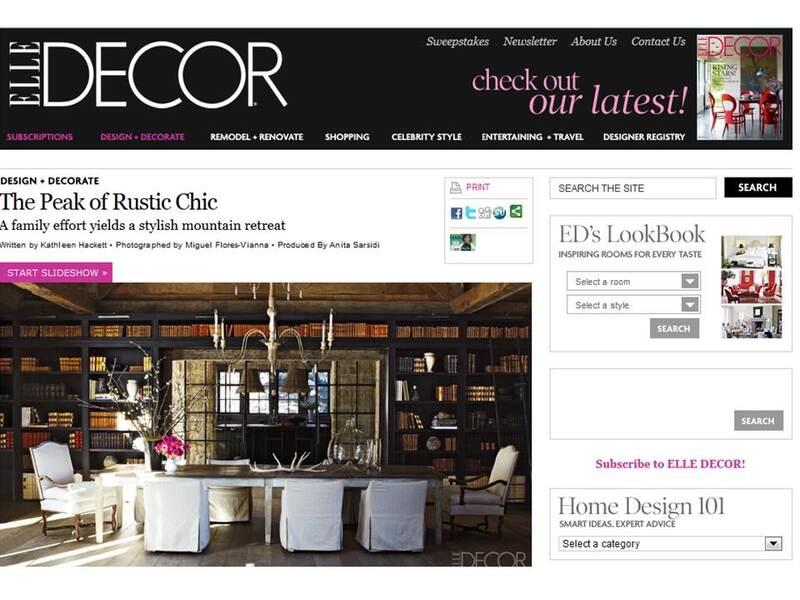 I am loving the contrast of the rich “library” space with the rustic farmhouse table – with the elite – white chairs! Some of you who may have been able to make it to my Purple Painted Lady Barn Sale last September (2011) will remember one of the artists I brought to the venue ….Antler Art. They had wine racks all made with shed antlers, lamps (floor and table), and chandeliers and candle holders. Linda and her husband are the amazing artists behind their creations! If you check out the Elle article I linked above – note the deer sheds on the table- and very important- understand how the deer sheds are “design” balanced with the modern white slip covered dining chairs. 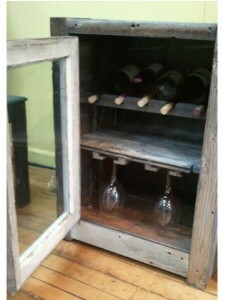 In line with Rustic Chic….for sale at The Purple Painted Lady is this Wine Cabinet. Totally UPCYCLED and reconstructed from reclaimed wood from a NY Barn. This piece is the perfect size in that it is not too big! 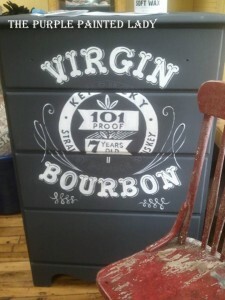 Imagine this on top of your wet bar- or for a mounting fee- it can be hung on your wall (within Monroe County). 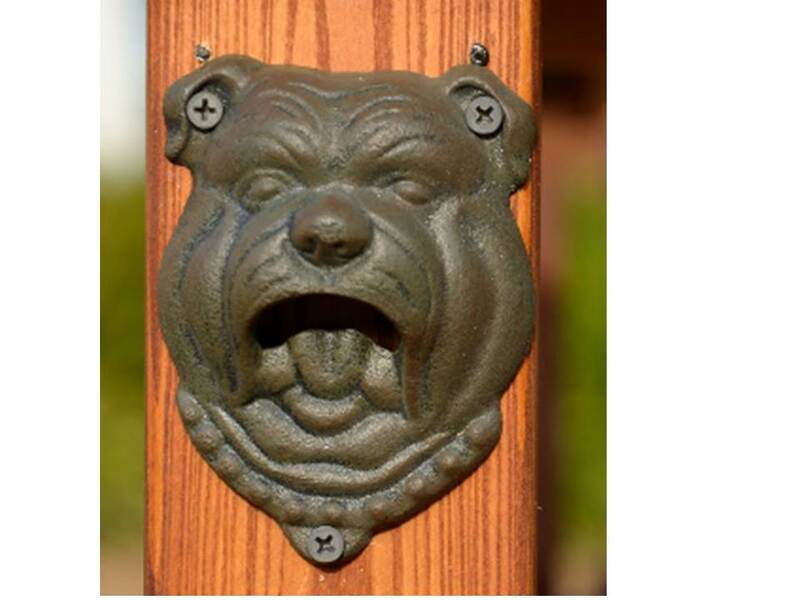 Mixing different extreme design styles is HOT and this beauty is perfect for even your bedroom or think covered patio! 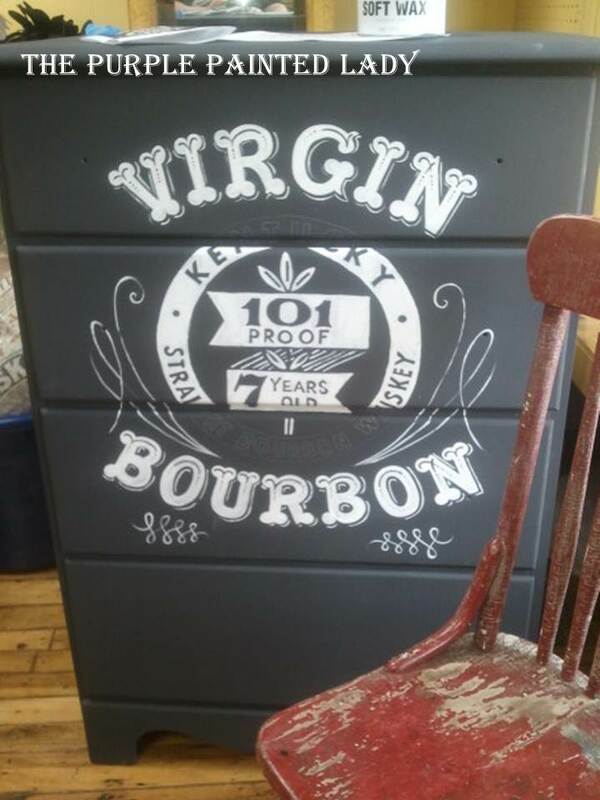 Having the gang over…..add a large galvanized tub filled with ice next to it and add some old style CoCo Cola or Root Beer bottles in it. 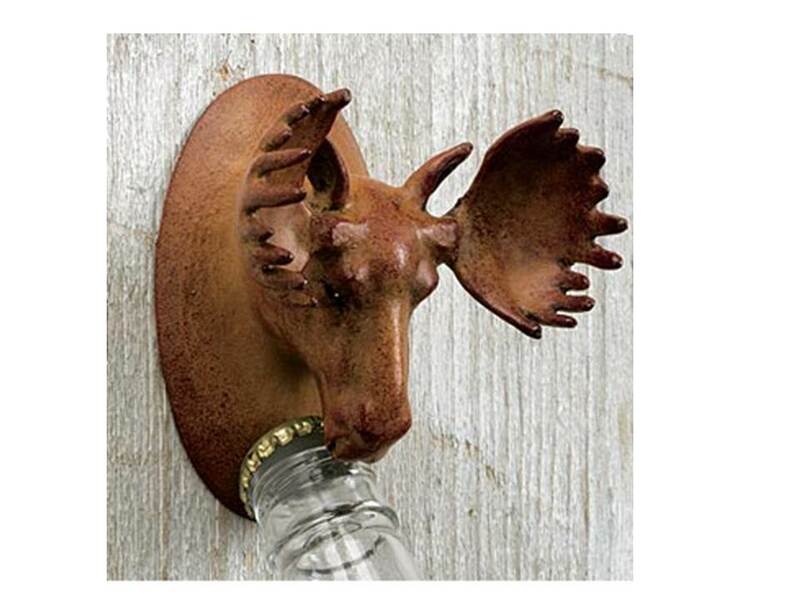 We can add a fun bottle opener to the side…maybe something like this? Add a thick wood cutting board with different cheeses,grapes and some PANE RUSTICO- otherwise known as Italian “Peasant” Bread crusty – (and if you have been blessed by the angels above and have a Wegman’s Grocery Store near you- save time and go there purchase all of this! And if you do not have a Wegman’s- my deepest condolences!) So, as I was saying- go to Wegman’s and buy some- they have tons of Fresh Crusty bread to choose from! All are to die for and blow your Atkin’s Diet over. Add some tangy olive’s and bruschetta- and your guests will never leave! Don’t forget to balance the rustic with chic…so perhaps add some white linen napkins and your finest wine or champagne glasses for fun! 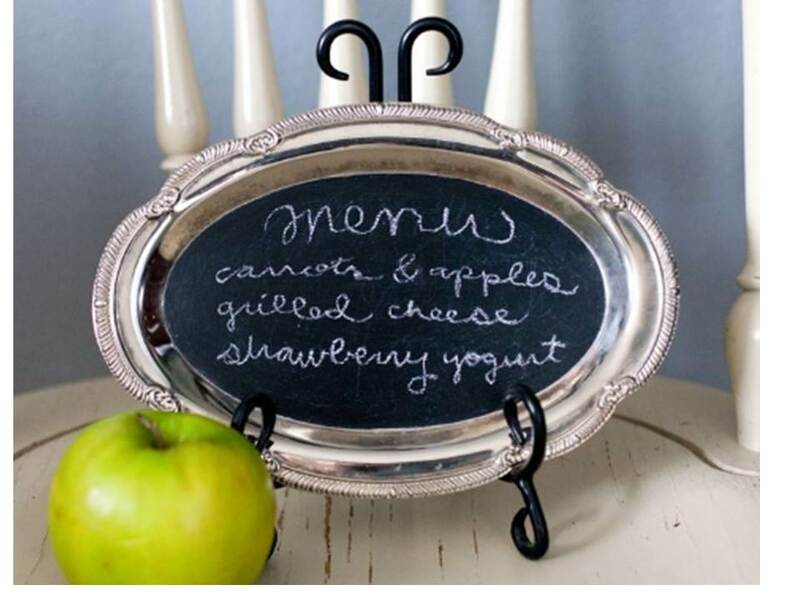 Write your menu on a Silver Tray Chalk Board that you created at one of The Purple Painted Lady’s workshops! 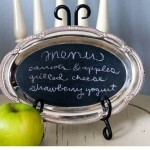 Never hesitate to add anything vintage! Think of vintage as a neutral color- it goes with everything! Personally- my fav thing to do would be to add a crystal chandelier hanging above so again- you have the opposite end of the design spectrum – totally cool! 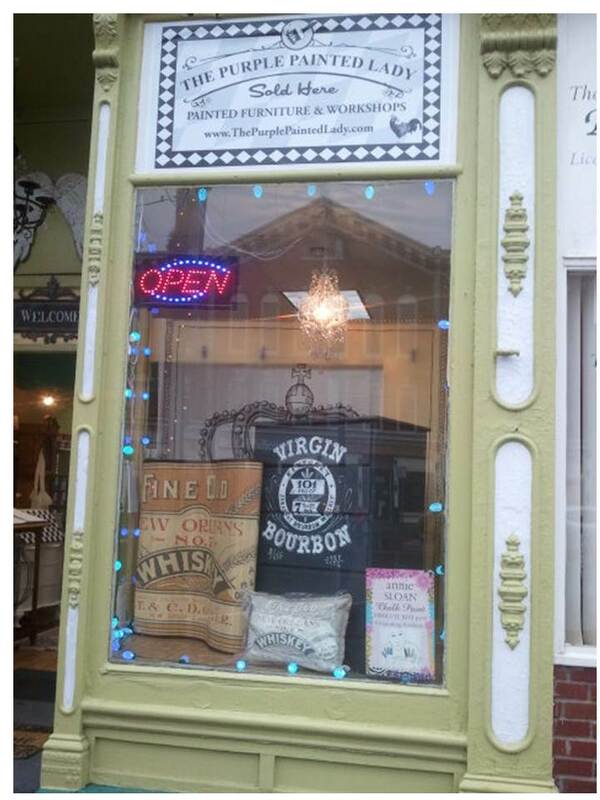 (and where do you get a reasonable priced “plug in” chandelier you ask? Well- if you are in Upstate NY…check Hobby Lobby (but only purchase it when lighting is 50% off- which is at least once per month!) 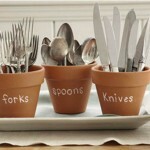 OR, visit Target or T.J.Maxx (Homegoods) If you are spending more than $60- you spent too much! If not a hanging chandelier, get your hands on a candelabra- that would be fun too! Or-one last idea – that I think you should do anyways! 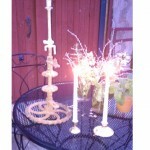 Is add an old chandelier outside and use candles instead of electric. 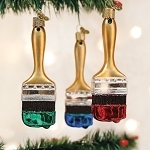 These look great hanging from a tree in the back corner of your yard. Add a chair and side table and you have a fun retreat! Look on the Rochester Craigslist to find old brass kitchen lights for minimal cost and spray paint…add some crystals and voila! You are all set! After you have this entertaining set up complete…you are ready for one heck of a party! 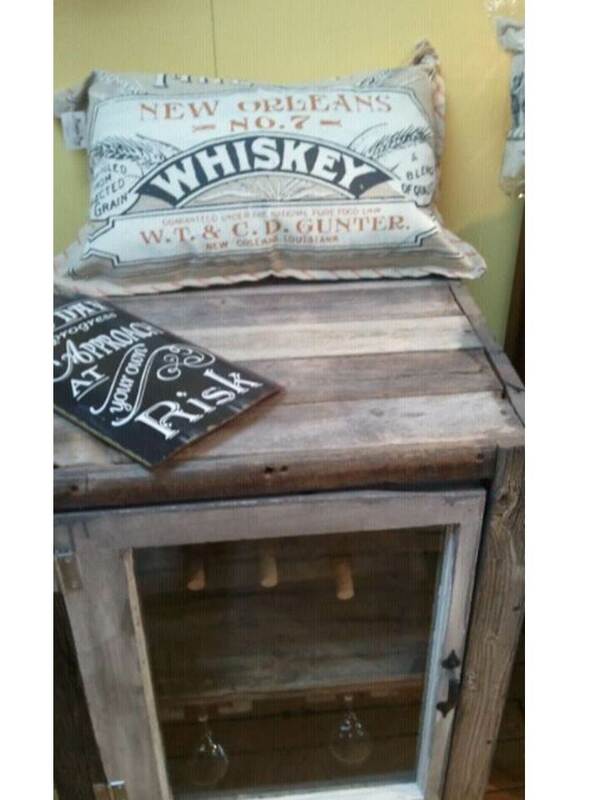 But back to this Rustic Cabinet though. Here are it’s dimensions…..it is 30″ tall x 18″ deep x 22.5″ wide. 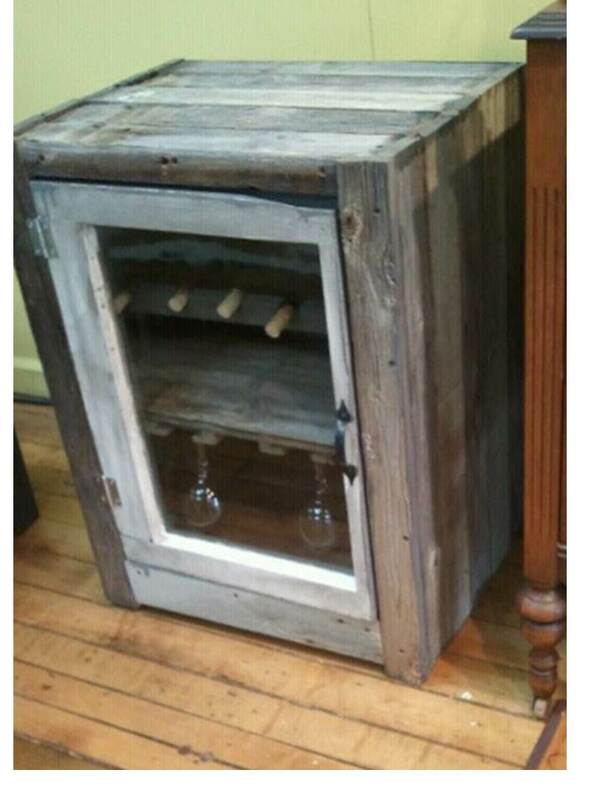 It holds 5 plus bottles perfectly angled so corks stay moist and 8 plus LARGE & TALL glasses. Set your corkscrew on the little shelf inside and you are all set for a wonderful evening! Hope you enjoyed this little article! 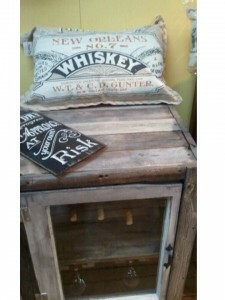 Price of the Rustic Chic Cabinet is $225 and found at The Purple Painted Lady! Hope you enjoyed this little article! 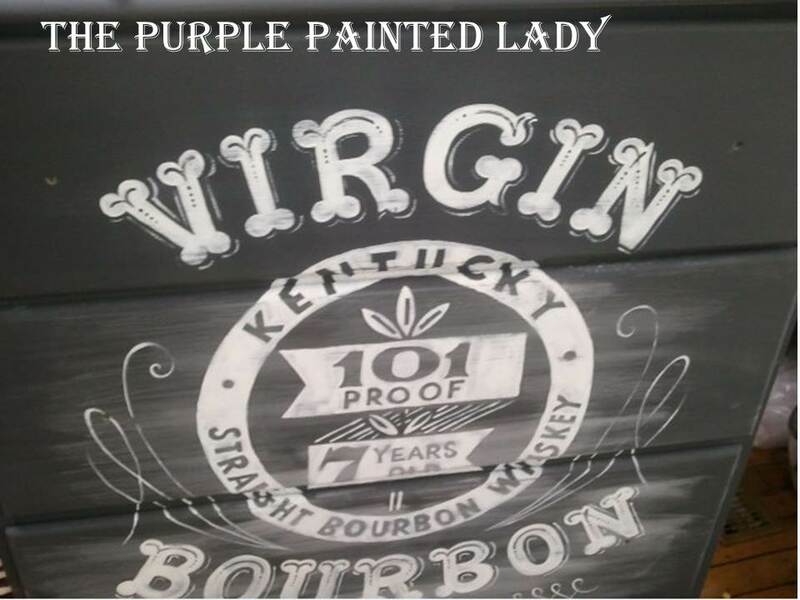 Please write to me, “Dear Purple Painted Lady” with questions and you may be featured right here on-line! 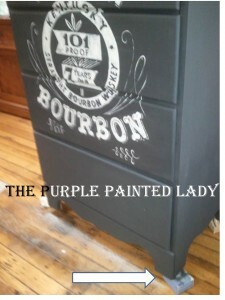 I started painting this sweet little dresser last week and FINALLY finished it today. Not because it took so long to do, but rather I just kept getting side tracked, but not today! 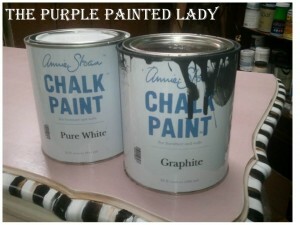 Soft and muted pastel harlequin on top, a NY Finger Lake inspired landscape…and the perfect shade of purple by Annie Sloan Chalk Paint called Emile. 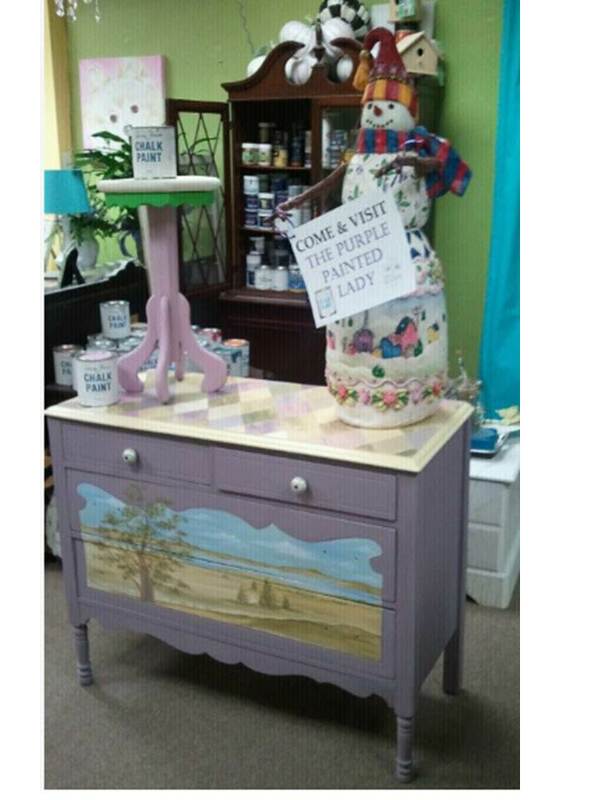 In fact…this whole dresser was painted with Annie Sloan Chalk Paint..yep- all of it! If you love her but are thinking, “nothing else in the room will match her.” No problem! 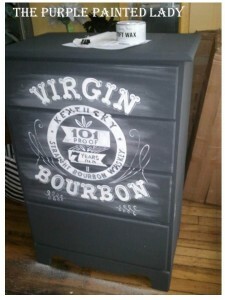 Bring me in another piece and I can paint it in a matching design! Totally easy-peasy! 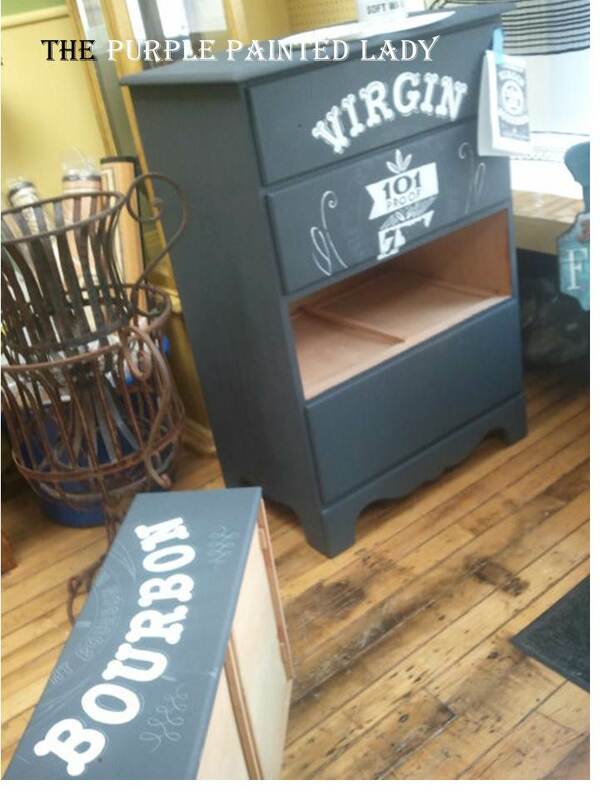 So, come and visit her (meaning this sweet dresser) at my shop – 208 East Main Street in Palmyra! Keep in mind- pending where you live- if you travel to Eastview Mall- MY SHOP IS LOCATED ACTUALLY CLOSER TO YOUR HOME.